Omega-3 ranks among the most important essential nutrients out there today. In 2008, the American Journal of Clinical Nutrition2, 3, 4published three studies investigating the role of EPA and DHA omega-3 fatty acids in elderly populations. 3.DHA affects your child’s learning and behavior. Do you want to maximize your child’s intellectual potential? A study published in Plos One in June 20138 linked low levels of DHA with poorer reading, and memory and behavioral problems in healthy school-age children. In another study published in the American Journal of Clinical Nutrition in August 2013,9 children who consumed an omega-3 fat supplement as infants scored higher on rule learning, vocabulary, and intelligent testing at ages 3 to 5. 4.Omega-3 has been found to save the lives of children going through short bowel syndrome (SBS), which is uncommon but impacts thousands of people in the United States. SBS can occur from birth (when a portion of the intestine fails to develop) or due to an infectious inflammatory disease striking premature newborns. In adults, it can be caused by surgery for Crohn’s disease or injury. Alarmed by the situation, Dr. Mark Puder, surgeon at Children’s Hospital Boston,10 said that they knew most of the children with SBS were going to die. Then the physicians noted that when the kids were given the nutritional supplement Omegaven (made of fish oil), they began to improve drastically. Special attention should also be given to the fact that most women have major deficiencies of omega-3. A 1991 study at the Mayo Clinic focused on 19 “normal” pregnant women consuming “normal diets,” and it showed that all were deficient in omega-3 fats. Another study compared Inuit (Eskimo) women to Canadian women, and it revealed omega-3 deficiency in the milk of the Canadian nursing moms. Animal cells cannot form omega-3, so a fetus must obtain all of its omega-3 fatty acids from its mother’s diet. A mother’s dietary intake and plasma concentrations of DHA directly influence the DHA level of the developing fetus, impacting the child’s brain and eye health. •Fish – In a perfect world, fish can provide you all the omega-3s you need. Unfortunately, the vast majority of the fish supply is now heavily tainted with industrial toxins and pollutants, such as heavy metals which include mercury, lead, arsenic, and cadmium, PCBs, and radioactive poisons. These toxins make eating fish no longer recommended. About the only exception are wild-caught Alaskan salmon and very small fish like sardines. The highest concentrations of mercury are found in large carnivorous fish like tuna, sea bass, and marlin. You may need to be especially cautious of canned tuna as well, as independent testing by the Mercury Policy Project found that the average mercury concentration in canned tuna is far over the “safe limits” of the Environmental Protection Agency (EPA). •Fish oil – Fish oil is among the primary ways that people enhance their intake of omega-3 fats. High-quality fish oils can certainly provide many health benefits. However, this oil is weak in antioxidants. This means that as you increase your omega-3 intake through fish oil consumption, you actually increase your need for added antioxidant protection. This happens because fish oil is a bit perishable, and oxidation leads to the formation of harmful free radicals. Antioxidants and other protections are therefore necessary to ensure that the fish oil doesn’t oxidize and become rancid in your body. •Cod liver oil – I no longer recommend this because of the potential for problematic ratios of vitamins A and D.
•Krill oil – This is my preferred choice for animal-based omega-3 fats. Krill oil not only contains the important and necessary DHA and EPA omega-3 fatty acids, but they are bound to phospholipids (see a discussion on this later). Additionally, krill oil’s antioxidant potency is 48 times higher than fish oil. Krill – or “okiami” as the Japanese call it – are small, shrimp-like creatures that are a cherished food source in Asia since the 19th century or earlier. •A January 2011 study in Lipids11 found that the metabolic effects of the two oils are “essential similar,” but krill oil is as effective as fish oil despite containing less EPA and DHA. •Another data, still unpublished in that year, suggests that krill oil is absorbed up to 10 to 15 times as well as fish oil. Its molecular composition12 is said to account for this better absorbability. 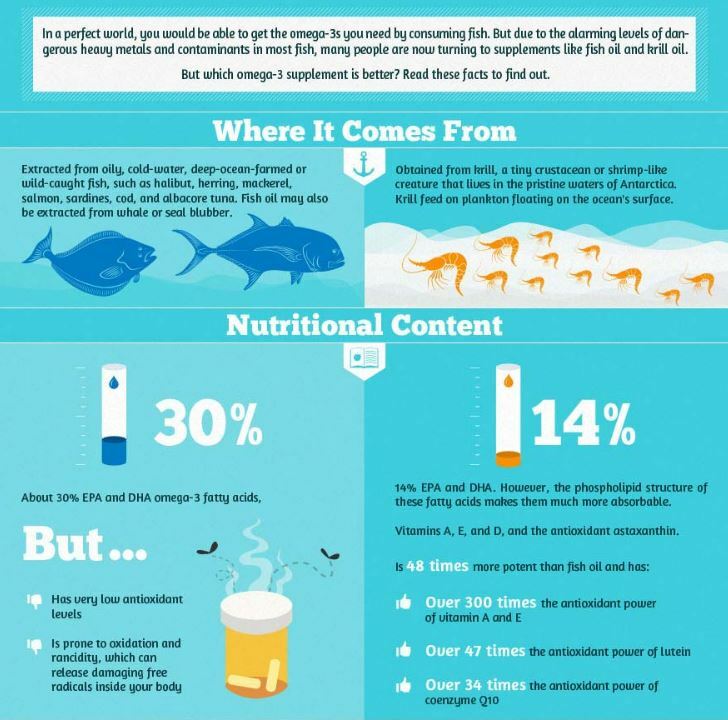 This Mercola infographic will provide a summary of why I choose krill over fish oil. But if you keep reading below, you’ll find out more about the advantages of this omega-3 supplement. Maximizing the benefits you get from omega-3s is highly dependent on how they are absorbed and transported throughout your body. Although these fatty acids are water soluble, they cannot be easily transported into your blood in their free form. Therefore, they need to be packaged in lipoprotein vehicles for them to be better absorbed into your bloodstream. When you ingest fish oil, you’re getting omega-3s that are attached to triglycerides that needed to be broken down in your gut to the base fatty acids DHA and EPA. Unfortunately, about 80 to 85 percent of these omega-3s are eliminated in your intestine. What’s more, phospholipids serve as essential building blocks of your cells. They are crucial to the structure of your cell walls, maintaining their strength and flexibility. By helping maintain your cells’ structural integrity, phospholipids help them function properly. Let’s examine the composition of these two fatty acids. EPA and DHA contain between 20 and 22 carbons, while ALA has 18 carbons. All of these fatty acids have their first double-bond in the third position, which is why they’re called “omega-3.” It’s how chemists write down the chemical structures. After ingesting good amounts of EPA and DHA, such as from salmon or krill oil, the fatty acid level in your plasma (blood) stays elevated for more than three days afterward. “Your body works on its distribution, redistribution and re-redistribution for three days. That’s hardly consistent with being ‘just food,'” Hoem says. Hoem adds that short-chain fatty acids like ALA are simply food — they’re a source of energy. But the long-chain fatty acids are structural elements. They’re not just “food” – they are actually essential in the composition of your cells – meaning they play a greater function in your body’s structure. What’s more, ALA is just a precursor to EPA and DHA. You need certain enzymes to elongate and desaturate ALA so it can become long-chained omega-3s. Unfortunately, this does not work in some people, particularly those who are deficient in certain vitamins and minerals, leading to very low conversion rates – only 1 percent of ALA is converted to EPA/DHA. In some, the conversion can even dip as low as 0.1 to 0.5 percent! From the time of your pregnancy through your child’s later life, omega-3 fats DHA and EPA have a radically important role in her brain health and other functions. I recommend supplementing with krill oil before and during pregnancy, and while you breastfeed. Babies receive DHA through your breast milk, so continuing breastfeeding through the first year will give your child a great headstart for health and success. •It should be made from Antarctic krill, which is by far the most abundant and most bioavailable source today. •The company should have a valid sustainability certification such as from The Marine Stewardship Council (MSC), ensuring that it’s harvested in compliance with international conservation standards. •The krill oil must be cold processed in order to preserve its biological benefits. Unfortunately, some of the most popular krill oil brands in the market use hexane, a dangerous chemical agent. Make sure that this chemical is not used to extract the oil from the krill. •The oil should also be free of heavy metals, PCBs, dioxins and other contaminants. •It should be encased in hard capsules instead of soft gels. Soft gels cause more oxygen to reach the content, which makes the oil more prone to rancidity. Even though krill oil contains astaxanthin that decreases oxidation significantly, hard capsules provide additional protection, assuring maximum effectiveness and freshness. 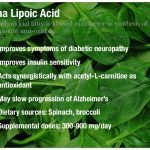 Alpha Lipoic Acid: A True Anti-Oxidant! 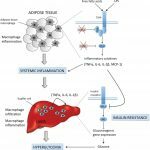 Supplementing with alpha lipoic acid can result in measurable gains in both strength and muscularity.